It was the dog days of summer — highs in the upper 90s, the humidity made the air thick, and life was moving slower than Bayou Vermillion. I was a twenty-something vegan, driving a VW van, and a practicing yogi. I lived in the hip part of town, the St. Streets, at 929 Azalea. I was enjoying cannabis daily and putting in motion the build-out of a commune in Leonville with friends. My devout Catholic parents thought they had lost me and prayed the rosary every day to “get me back.” It was all so apropos for a Southern artist in the 60s. If Annamae and Robert were worried about my hippiness, it’s good they didn’t meet my neighbors. Across the street lived a gang of bikers, members of the Iron Knights MC. To their left lived a peeping-tom known in the neighborhood as Peep — a nasty, sweaty, sleuth who didn’t like me much, and I wasn’t trying hard to be his friend. The bikers on the other hand were very friendly. They named me Frank. I guess it was a better fit for their hyper-masculine, badass persona. Phil, Don Ray, Jon, and Frilo. I spent a stint cooking offshore for roughnecks who despised me. I always wonder why I was popular with bikers but not the oil riggers. Maybe it was the vegan dishes I served them. My afternoon with the Iron Knights transitioned into an all-American dinner at the leave-it-to-beaver home of Harry and Mavis, parents of my housemate Gary. The duality of life was the norm back then as I aspired to live detached and self-realized: I always found my way back to the comforts of family and food. I parked my van in the front of their new house on Wilson Street. Gary had ridden shotgun. It had started to cool and the cicadas were singing. When we arrived we were greeted by Mavis with the news that Elvis had died. I can't remember what we ate, but I remember the topic of conversation: Elvis. We turned on the TV and there was a clip of Elvis as I had not seen him before, obviously overweight. The 1977 Elvis I was seeing appeared to be an inflated blow-up doll. The show made me realize how Elvis had become mythic, iconic and tragic, and what made him endearing to his public. There is a line in the song “Sergeant Pepper’s Lonely Hearts Club Band” about Sergeant Pepper coming in and out of style. 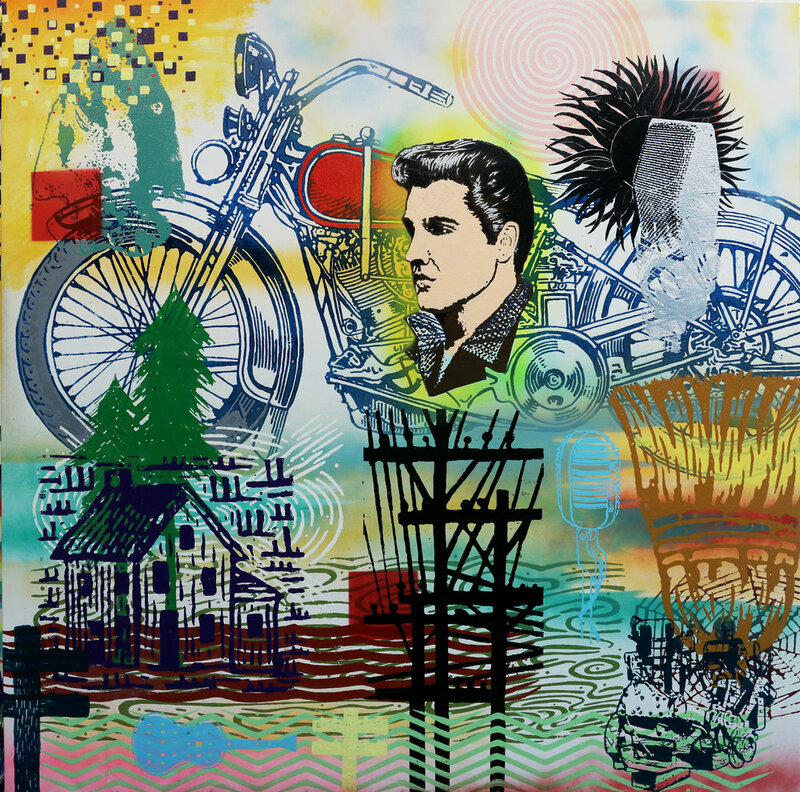 Elvis, as a human, had those peaks and troughs, but as an icon does … his imagery and audio remain iconic — a source of inspiration for future generations. SURE, I LOVE TO RECEIVE UPDATES ON PAVY’S NEW PROJECTS AND EXHIBITIONS.